Cafe Escapes K-cups only $3! A lot of Walmarts have Cafe Escapes K-cups on clearance. If yours does, you can get a good deal on them! 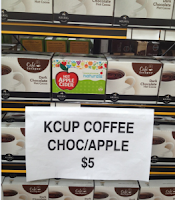 That's only $0.25 per K-cup, which is a pretty decent price! Thanks, Centsless Deals for deal and photo!